Scrapers are a mess when showing unqualified work, most of which workers can never qualify for to begin with. Qual tests & HITs are few and far between and showing work a worker isn't qualified for takes focus away from HITs they can complete now. Requesting qualifications doesn't work. The system has been broken for a long time and outside of very rare circumstances (auto-granted) will almost never even alert the Requester to your request. Since they're never alerted to qualification requests and the requests are locked away where they can never been seen, it's rare that they ever grant them. Stop wasting time on this! TurkerView will keep an eye on MTurk while you're working and scrape, sort, and organize a multitude of qualifying tasks that you can check periodically to open up new work. This allows you to focus on the work actually available to you while opening up new opportunities during down time and eliminating wasted time & focus. Read our full announcement thread here or stop in to ask questions, chat, & get familiar with our awesome community. New to MTurk? Get the Adult Content Qual. Want access to our collection of hundreds of curated qualification tests & HITs? 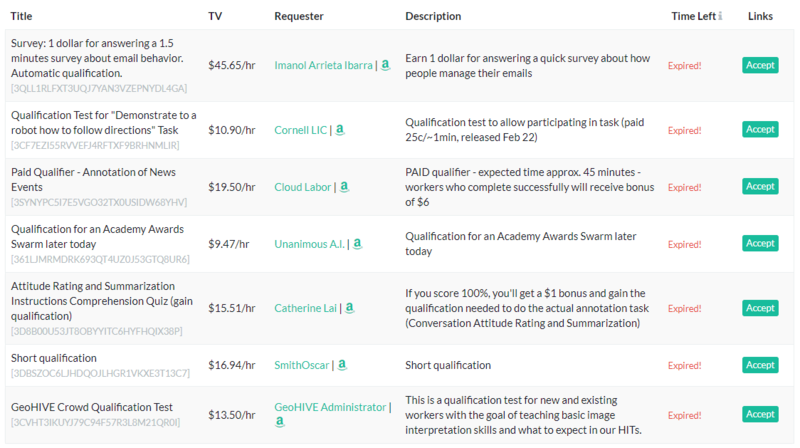 MTurk posts qualification HITs for their premium qualifications that offer requesters more defined worker demographics. They're unpaid, but it is a good idea to fill these out but be careful, many cannot be changed once submitted. Be Careful! You may not be able to complete these again, so please make sure to preview them first!